Saturday November 10th 1923 We had a message from Burlington last night. Birdie is ill so I did not go down today. The girls were all over to Mrs Swishers for dinner. I went out there in afternoon and came home with them. weather fine. Sunday November 11th 1923 It was a wonderful day. The Whetstones with myself and Charles rode to The Tri Cities and back by supper time. Had dinner at Wilton on the way down. Emily Bremner went away this AM. Ott & Fannie drove to Des Moines. Monday November 12th 1923 I went to town with Cora in AM. Got my hat fixed and took treatment with Dr Stryker. I was sewing some in PM. Hattie & Cora both away. There was little doing in town today. Vacation for Armistice Day. 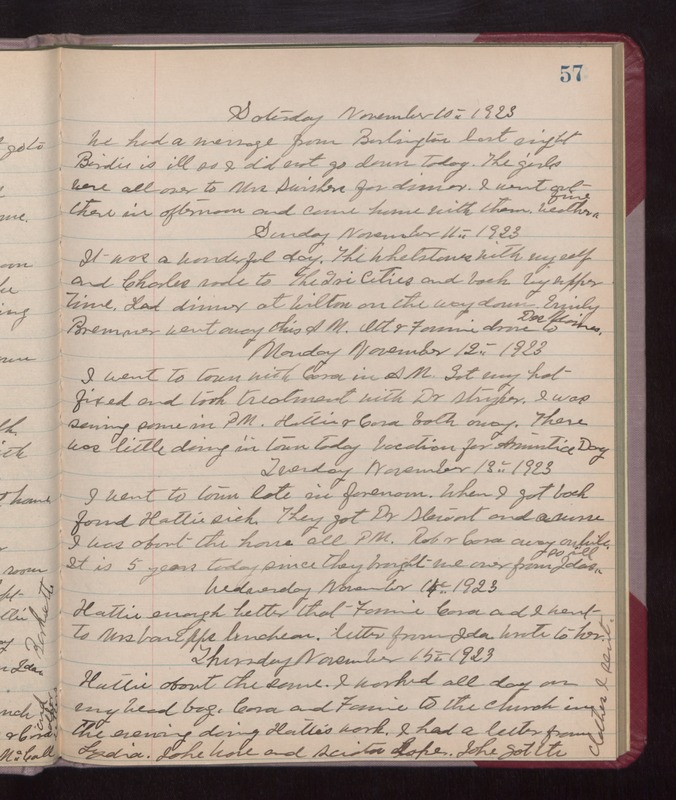 Tuesday November 13th 1923 I went to town late in forenoon. When I got back found Hattie sick. They got Dr Stewart and a nurse. I was about the house all PM. Rob & Cora away awhile. It is 5 years today since they brought me over from Idas so ill. Wednesday November 14th 1923 Hattie enough better than Fannie Cora and I went to Mrs VanApps luncheon. Letter from Ida. Wrote to her. Thursday November 15th 1923 Hattie about the same. I worked all day on my bed bag. Cora and Fannie to the church in the evening doing Hatties work. I had a letter from Lydia, John Ware and Sciota Lape. John got the clothes I sent.